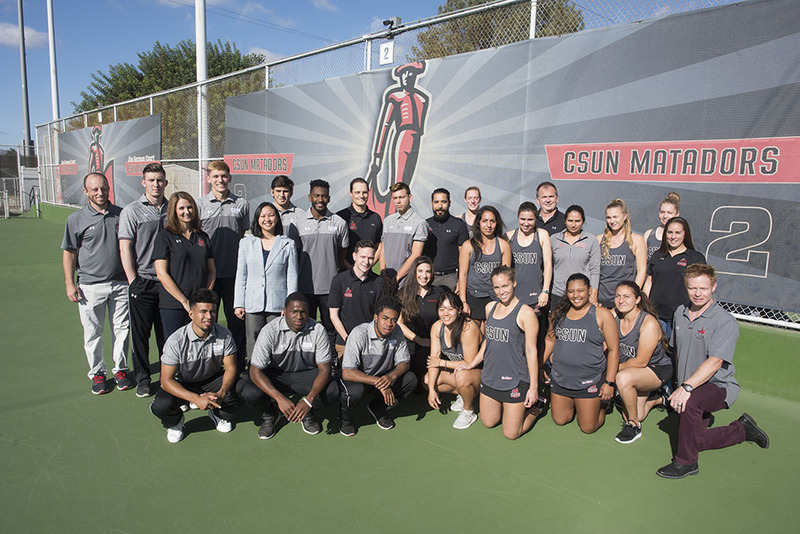 Members of California State University, Northridge's Under Armour Faculty mentoring program pose with members of the tennis and men's soccer teams. When Ed Jackiewicz met Tera Trujillo in spring 2015, she was studying at a desk she’d carried to the corner of the California State University, Northridge soccer field, in a “time out” of sorts, unable to practice because she’d just earned a D in an economics class. Jackiewicz, the chair of California State University, Northridge’s Department of Geography and Environmental Studies, is also CSUN’s faculty athletics representative — he’s an outside observer, someone not of the athletics department who helps promote the academic success of student-athletes on campus. With coach Keith West’s support, Jackiewicz struck up a conversation with Trujillo, and decided her grades weren’t reflective of her abilities. He invited her to his office for a conversation. Trujillo confessed that she’d picked her major — journalism with a sociology collateral — because she was a good writer and figured she would excel at it, not because it was her passion. Her passion was planet Earth, and being outside, and learning about the environment and humanity’s impact on it. Thanks to that step outside the world of athletics, Trujillo ’17 changed her minor to geography, and is now pursuing a master’s in geography at CSUN with the goal of becoming an environmental researcher and professor. Trujillo’s story is a dramatic example of the great outcomes from a CSUN mentoring program called the Under Armour Faculty. The Under Armour Faculty members —who each get a special Under Armour polo in honor of the university’s sponsorship deal with the apparel company — is a group of 17 faculty members from majors and departments across campus who serve as a resource for more than 350 CSUN student-athletes. Jackiewicz and the Director of Intercollegiate Athletics, Brandon Martin, are currently recruiting new members, who can guard against the tunnel vision that can arise in college athletics due to the focus student-athletes often have on their sport. Incentives of the job include athletics gear, free access to games, and, in some cases, the chance to travel with the teams. Under Armour Faculty members can answer questions about what majors best fit interest levels, what classes to take for a particular major, and what activities and internships will provide the best preparation for life after sports. For example, if a student was interested in majoring in psychology, that student can be connected with a psychology professor. Once a month, the faculty members also host a themed breakfast focusing on one of the university’s colleges. Student-athletes can learn about majors and careers, and ask questions to learn how to pursue careers in related fields. Beginning this year, 10 or so faculty members also serve as mentors to about 80 freshman student-athletes. Each mentor has eight or nine students, and holds monthly meetings to talk to students about life in general or to answer specific questions. Jonathan Martinez, an assistant professor of psychology, was one of the first professors to join the program. He often talks to the student-athletes about time management and the importance of self-care. He said these talks have given him perspective on all the obligations for student-athletes as well as students in general. The original idea for the Under Armour Faculty program, according to Jackiewicz, came from CSUN President Dianne F. Harrison, who is a member of the NCAA Board of Governors and was a faculty athletics representative at Florida State. The program was originally modeled after one at Georgia Tech, but Jackiewicz and Martin continue to make changes to fit CSUN’s needs. Martin said he envisions the program evolving from informal meetings into a faculty leadership academy, where student-athletes can receive instruction, mentoring and post-collegiate support. For more information about participating in the Under Armour Faculty program, contact Ed Jackiewicz at ed.jackiewicz@csun.edu.